Doughnuts were never a big deal to me growing up. Well, scratch that. Sorry. Because we so rarely ever ate doughnuts, they were a HUGE thing to me and my brother as kids. But they certainly were a special occasion treat, like pool days at our friend Jarrod’s house. Dude, those were the days! We literally almost burst at the seams with excitement on those days – both about getting to swim for the day and about the Munchkins that taunted us sitting on my unbuckled lap…in the front seat of mom’s car. Hey, it was the 80s – what can you do? These days, as an adult, I won’t lie – I still get pretty excited about both of these things. Pool swimming, chlorine and all, still rocks my adult world and doughnuts still send a thrill down my spine. A few years ago Kyle and I found a nearby old-fashioned diner that sells the best (really, the best) doughnuts around. We’re both early birds so getting up at the crack of dawn to get warm, fresh doughnuts a few times a year is never an issue and it makes for a fantastic start to a Sunday. 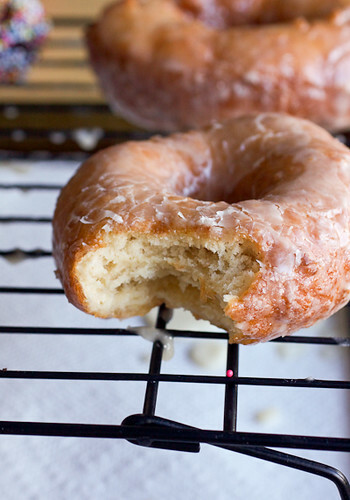 Anyway, I’ve been wanting to make doughnuts like our favorite diner cake doughnuts at home for ages, and these were pretty spot-on to our favorites. Once the dough hits the hot oil, it puffs up and creates this fantastic crunchy exterior while still keeping the inside soft and light. Rolled in cinnamon-sugar right out of the fryer? Absolute perfection. Draped in vanilla glaze? Not so horrible either. Dunked in chocolate glaze then coated in toasted coconut? Sweet heavens! These doughnuts are without a doubt a special occasion treat and being that they take about 2 hours to make, I can’t see us making them often but when that homemade doughnut hankering hits again, we’ll be ready. Maybe even for the pool days that lie ahead of us this summer. Travel note: Seriously, if you traveling I-84 through Connecticut, get off at exit 15, drive north on Rt. 67/6 into Woodbury (about 3.5 miles) and stop at Dottie’s Diner on the left. It’s a light blue building at the end of a short row of stores. 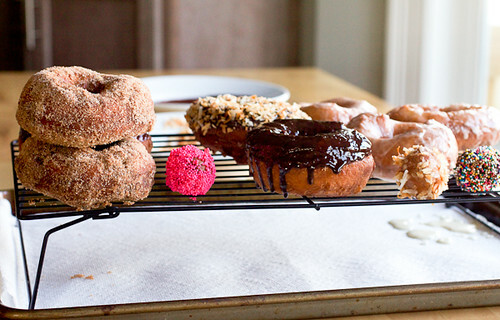 Freaking.amazing.doughnuts. Housekeeping note: There are just a few days left to enter Sub-Zero and Wolf’s $100 Visa giveaway here on the blog. Be sure to check out this post featuring Part 1 of our new kitchen design for details on how to enter! To cut the dough for these doughnuts, any round cutter will work - biscuit or cookie cutters are perfect. In a pinch, you could also use a glass or just cut them out by hand with a knife. If you don't have a doughnut cutter, you'll also need something to cut out the centers and a large round pastry tip works great for this. We got 8 really big doughnuts from this recipe and would likely make them smaller the next time - they were almost overwhelming. To make the dough: Whisk the flour, sugar, baking powder, cinnamon, and salt together in a large bowl. In a 2-cup glass measuring cup, whisk the milk, egg, butter, and vanilla together. Pour the wet ingredients over the dry ingredients and mix them together with a rubber spatula only until just combined. Cover the bowl with plastic wrap and refrigerate for 1 hour. For the cinnamon-sugar coating: Mix the sugar and cinnamon together in a medium bowl until well-combined. For the chocolate glaze: Place the chocolate in a medium bowl. Heat the half-and-half until simmering, pour it over the chocolate and stir until the chocolate melts. Slowly whisk the sugar into the chocolate until completely incorporated. For the vanilla glaze: Whisk the sugar, half-and-half, and vanilla together in a medium bowl until well-combined and no lumps of sugar remain. Add extra half-and-half by the teaspoon until the glaze reaches your desired consistency. 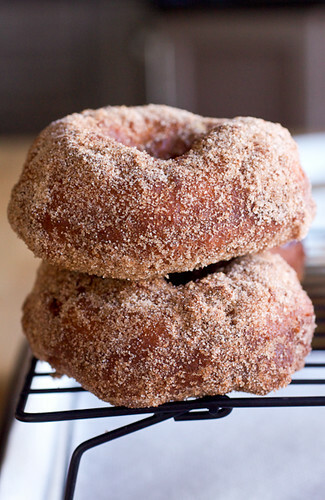 To fry the doughnuts: Heat the oil in a large Dutch oven or wide stock pot over medium-high heat. Transfer the dough to a well-floured work surface and roll the dough out to ½- to ¾-inch thickness. Using the cutter of your choice, cut the dough into rounds then pop out the centers of the rounds with a smaller cutter or large round pastry tip. Once the oil has reached 365° F (use a candy thermometer for this that attaches to the side of the pot), gently lower 3 or 4 of the doughnut shapes into the oil. They should sink then rise to the top. The oil temperature will likely drop so you'll need to turn the heat up a little in order to keep the temperature up - keep an eye on it - you want to maintain the oil temperature around 365° F. Cook for 2 to 3 minutes per side until they are puffed up and deep golden brown. Using a slotted spoon, transfer the doughnuts to a paper towel-lined baking sheet to drain. Repeat with remaining dough. As soon as you can safely handle the doughnuts, roll some of the doughnuts in the cinnamon-sugar mixture - the coating sticks better when the doughnuts are still really warm. Allow the other doughnuts to cool for a few extra minutes before glazing with the chocolate and vanilla glazes. Keep leftover doughnuts covered at room temperature. They will last no more than a day if they aren't all eaten first. To cut the dough for these doughnuts, any round cutter will work – biscuit or cookie cutters are perfect. In a pinch, you could also use a glass or just cut them out by hand with a knife. If you don’t have a doughnut cutter, you’ll also need something to cut out the centers and a large round pastry tip works great for this. We got 8 really big doughnuts from this recipe and would likely make them smaller the next time – they were almost overwhelming. Transfer the dough to a well-floured work surface and roll the dough out to ½- to ¾-inch thickness. To cut the dough for these doughnuts, any round cutter will work – biscuit or cookie cutters are perfect. In a pinch, you could also use a glass or just cut them out by hand with a knife. If you don’t have a doughnut cutter, you’ll also need something to cut out the centers and a large round pastry tip works great for this. We got 8 really big doughnuts from this recipe and would likely make them smaller the next time – they were almost overwhelming. Once the oil has reached 365° F (use a candy thermometer for this that attaches to the side of the pot), gently lower 3 or 4 of the doughnut shapes into the oil. They should sink then rise to the top. The oil temperature will likely drop so you’ll need to turn the heat up a little in order to keep the temperature up – keep an eye on it – you want to maintain the oil temperature around 365° F. Cook for 2 to 3 minutes per side until they are puffed up and deep golden brown. Using a slotted spoon, transfer the doughnuts to a paper towel-lined baking sheet to drain. Repeat with remaining dough. As soon as you can safely handle the doughnuts, roll some of the doughnuts in the cinnamon-sugar mixture – the coating sticks better when the doughnuts are still really warm. Allow the other doughnuts to cool for a few extra minutes before glazing with the chocolate and vanilla glazes, and the toppings of your choice. Storage: Keep leftover doughnuts covered at room temperature. They will last no more than a day if they aren’t all eaten first. I’ve had the most intense craving for doughnuts lately, and these amazing looking doughnuts are not helping 🙂 That first one with the glaze is calling my name! I’ve never been in love with donuts except for when they are FRESH fresh fresh-these look soooo perfect! Mmm these sound sooo good!! They look lovely and delicious, I’d have trouble deciding what to top them with. Fresh, homemade doughnuts are so good! 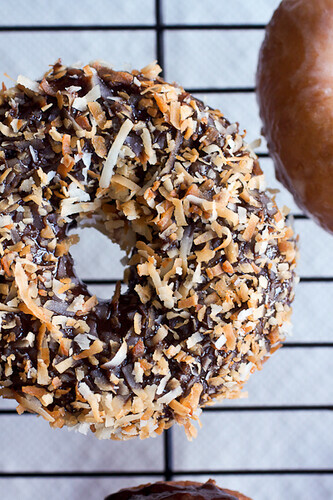 Love that doughnut covered in chocolate and coconut! Oh yum, I don’t think these would last long in my house!